2-Bed Ground Floor Apartment, the Beach is only 100 metres away –The apartment is Air Conditioned and has Internet access and French & UK TV, outside there is a patio area with table, chairs and barbecue. Electricity and Final Cleaning included in the price, linen and towels available at €15 per person per week. This fully equipped apartment is on the Mediterranean at Le Barcarès Grand Plage and is just 14 Miles from the City of Perpignan and 35 miles from the Spanish border and 100m from the Blue flag beach, bars, shops and restaurants and an ATM cash machine. Le Barcarès is a paradise for both water sport enthusiasts and connoisseurs of seafood. The apartment has Air Conditioning in addition to Internet access, UK Sat TV, DVD Player. Prices include electricity and final cleaning. The apartments has a floor areas of 40 sqM, and is 150 Metres from a number of bars, restaurants and shops and the blue flag beach. The apartment is equipped with a full modern kitchen with fridge freezer, dishwasher, washing machine, full oven and ceramic hob and bright modern shower room. The apartment is tiled throughout, and comprises a large main bedroom, a second smaller bedroom, kitchen/diner, Sun Lounge and an outside patio. There is a water park, quad biking, water sports and a funfair nearby, a safari park and the vineyards are some of the other attractions within a reasonable traveling distance. Port Barcares lies between the Mediterranean Sea and a large lake. The beach is wide and sandy and has an EC Award. The Port has many leisure boats and a good selection of shops and restaurants to visit in the evening. The region around Perpignan is of great interest; here you can combine a beach holiday with excursions to explore the foothills of the Pyrenees. Villefranche is an interesting town where you can take 'the little yellow train' for a fascinating trip into the Pyrenees. Barcares Village has a regular market with local produce and in Port Barcares there is a Sea Water Thalassotherapy treatment centre. In July and August the resort throngs with visitors. Cap Leucate is a landmark for both seafarers and migrating birds. It is a popular area for hikers and mountain bikers. Sightseeing/Eating Out: Port Barcares is located on the Golfe du Lion and is home to one of the largest marinas on the French Mediterranean coast the other being at nearby Port Leucate. The Superb beach is Blue Flag and 5 Miles long. It is home to the Lydia, a 100 metre Steamship built in 1931 & deliberately run aground in 1967. The area around Barcares is renowned for its seafood, particularly Oysters which are celebrated with a week-long festival in March. Wine Production is as important as fishing in this area which is France's largest wine producing region. August being an essential season for the peninsula where you can taste a wide range of local wines such as Corbiere, Fitou, Muscat de Rivesaltes and Minervois. Ryanair fly from Stansted and Birmingham to Perpignan which is 14 miles away. Modern fully tiled Shower Room with WC and Vanity Unit with Heated Towel Rail or radiator, Beach towels included. Fully Equipped Kitchen with full oven, full fridge freezer, dish washer, washing machine, halogen hob, Coffee Maker, toaster, kettle, stainless steel sink and drainer. Satellite TV System, DVD Player with a large selection of DVDs , CD Player with a large selection of Cd's. Although not specifically designed for disabled access the apartment is ground floor and everything is on one level. Outside there is a fully tiled patio area with table and chairs. The images online were very accurate and we liked the simplicity of the property. For our purposes, a beach holiday with plenty of access to water for our Labrador, the property could not have been better. It's 100 metres from the beautiful sandy beach, with the dog-friendly part of the beach a further 200 metres away. The inland lagoon is around 500 metres away and is perfect for dog-walking and swimming. The local shops and restaurants are no more than 300 metres away and the apartment was very quiet with minimal noise from neighbours. The property is simple but very effective, everything necessary for a self-catering holiday is there, even down to a coffee bean grinder and garlic press ! The wifi was perfectly adequate for our needs, the property was clean, the sheets and towels changed weekly, the access easy, and the directions from our host could not have been clearer. We are just a couple with a dog but the apartment would be plenty big enough, in our view, for a family of four. One small point, the patio garden is a little soulless as the conservatory takes up space but this would our only negative feedback and certainly didn't detract from our holiday. We were in the south of France by the beach for two weeks in 30+ degrees every day, we weren't there to sit on the patio of the apartment ! Finally, access to the local area from the apartment is excellent. Not only is the road access very good but the international airport at Perpignan Rivesaltes is no more than 20 minutes drive, and the regular bus service into Perpignan leaves from just up the road and cost just 4Euros between us for the return journey. We would definitely recommend this property both as a base to explore Languedoc Roussillon and to enjoy a relaxing beach holiday. 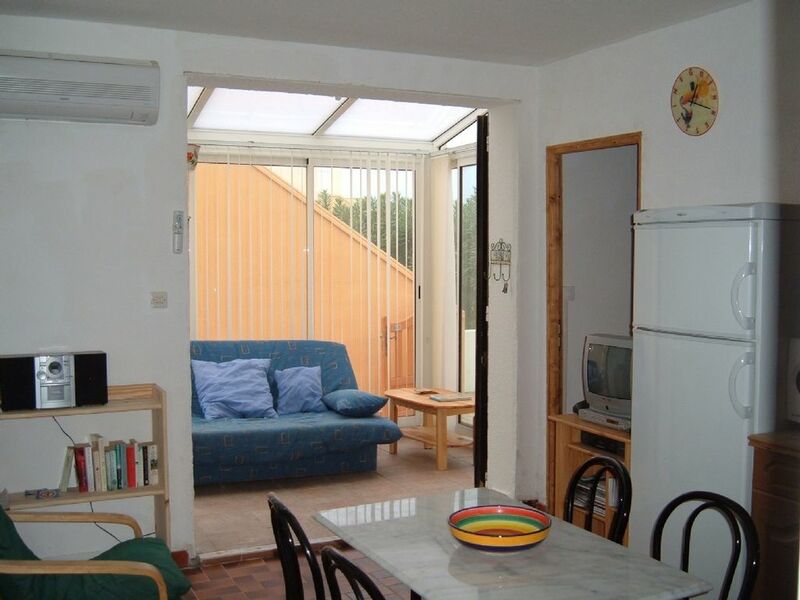 Clean well maintained apartment that has everything you'd need while on holidays. The property is located in a great area. It's close to a beautiful beach. It very quiet and the neighbours are very friendly. There is also a water park within walking distance that went down very well with the children. The apartments itself is spotless and had everything you'd need to self cater. There is also a bbq that came in very handy. The air conditioning is great works very fast and is simple to use. We were very happy with our stay and will definitely return. Thanks. We spent two weeks holiday in the Les Marines apartment and were satisfied with everything. The apartment is equipped with all you need for a comfortable stay and it takes just 3 minutes to got to the beatiful and very clean beach. The area is calm and there is lots of green all round. We loved it to seat in the garden and barbacue by the palm. We can only recommend it. Thank you. Appartement idéal pour famille et conforme à la description. Calme , proximité plage et petits commerces. Nous avons loué cet appartement avec 2 enfants en bas âge. Les équipements bébé nous ont bien dépannés. On a apprécié d'arriver et de trouver les lits faits. Le fait que le linge de maison soit fourni allège les valises. L'appart est idéalement situé: tout proche des commerces et de la plage. Il est possible de tout faire à pieds (même pour les enfants). Il est bien équipé (il y a tout ce qu'il faut dans la cuisine), la literie est confortable. Il aurait juste besoin d'un petit coup de jeune, notamment la salle de bain. Top location close to a clean beach, a lively city (Perpignan) and many interesting sites (castles, caves, fortresses, monasteries). The small appartement has all for a comfortable holiday, including climate control. Most of all there is a perfect communication with the very friendly owner via internet or SMS. For non french speaker it was really a pleasure to do it in English. We only have one wish: a detailed map in addition to the description how to find the place. Many thanks for the review. I will try and source a detailed map that I can send by e-mail for future guests. Close to Barcares Grand Plage are the Marinas of Leucate & Barcares where a number of Pleasure & Sea Fishing boats operate & there are a number of excellent sea food restaurants where you can have a drink & admire the fine yachts & cruisers. Nearby there is a waterpark & a casino, the Lydia steamship which was deliberately run aground in 1967 & is now a Tourist Office and Museum. Barcares Grand plage is 10 minutes from the A9 motorway & close to the interesting cities of Perpignan (with its Palace of the Kings of Majorca & its cobbled market area) & Narbonne with its fine Cathedral.